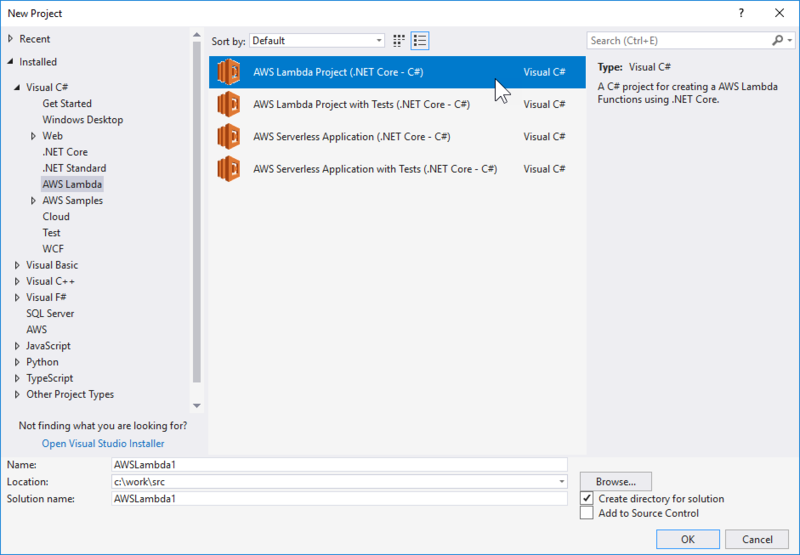 Using the AWS Lambda .NET Core project templates for Visual Studio you can easily create a AWS Lambda Function using Microsoft .NET Core. For prerequisites and information about setting up the AWS Toolkit for Visual Studio, see Using the AWS Lambda Templates in the AWS Toolkit for Visual Studio. Open Visual Studio, and on the File menu, choose New, Project. In the New Project dialog box, expand Installed, expand Visual C#, and select AWS Lambda. In the New Project dialog box, ensure that the Language, Platform, and Project type drop-down boxes are set to "All ..." and type aws lambda in the Search field. AWS Lambda projects for creating a project to develop and deploy an individual Lambda function. 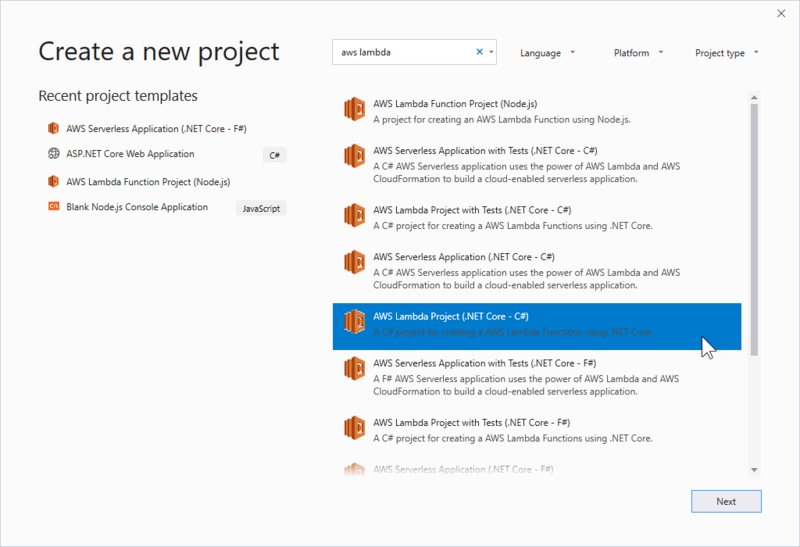 AWS Serverless Applications projects for creating Lambda functions with a serverless AWS CloudFormation template. AWS serverless applications enable you to define more than just the function. For example, you can simultaneously create a database, add IAM roles, etc., with serverless deployment. AWS serverless applications also enable you to deploy multiple functions at one time. Select the AWS Lambda Project (.NET Core - C#) template. Enter the desired Name, Location, etc., for your template project, then click OK.
Click Next. In the next dialog, enter the desired Name, Location, etc., for your template project, then click Create. After you select the project type, choose a blueprint. For AWS Lambda Project (.NET Core), the Select Blueprint page shows several Lambda function templates. Choose the type of Lambda function you want to develop, and then choose Finish to create the Visual Studio project. You can now review the project's structure and code. Examine the aws-lambda-tools-defaults.json file, which is created as part of your project. You can set the options in this file, which is read by the Lambda tooling by default. The project templates created in Visual Studio set many of these fields with default values. This is where the function handler is specified which is why you don't have to set it in the wizard. But if you rename the Function, Class or Assembly then you will need to update the field in the aws-lambda-tools-defaults.json file. When you use this aws-lambda-tools-default.json file, the only things left that the Lambda tooling needs to deploy the function are the name of the Lambda function and the IAM role. Your project is now ready to publish to Lambda. In Solution Explorer, right-click the project, and then choose Publish to AWS Lambda. On the Upload Lambda Function page, in Function Name, type a name for the function or select a previously published function to republish. Then choose Next. Required: Provide a Role Name for a role associated with your account. Choose an existing role or a new role based on an AWS managed policy or your own managed policy. The role is used to provide credentials for any AWS service calls made by the code in the function. Your account must have permission to run the IAM ListPolicies action, or the Role Name list will be empty and you will be unable to continue. Optional: If your Lambda function accesses resources on an Amazon VPC, select the subnets and security groups. Optional: Set any environment variables that your Lambda function needs. The keys are automatically encrypted by the default service key (which is free) or you can specify an AWS KMS key (for which there is a charge). KMS is a managed service you can use to create and control the encryption keys used to encrypt your data. If you have an AWS KMS key, you can select it from the list. The Uploading Function page is shown while the function is uploading, and automatically closes when the upload completes. To keep the wizard open so you can view the report, clear Automatically close wizard on successful completion at the bottom of the form before the upload completes. Close the page when you finish viewing the report. After the function is uploaded, the Function page opens. Use the tabs on the left side of the page to test the function, add event sources, and view the log. Use the Configuration tab to add VPC subnets and security groups, memory, timeout, and environment variables. To add event sources to establish a connection between an AWS resource (such as an Amazon S3 bucket, Amazon SNS topic, or Amazon Kinesis Data Streams streams) and a Lambda function, choose Event Sources. This will display the Add Event Source page. On the Add Event Source page, from Source Type, choose the appropriate event source and choose OK to add the event source. To test the function, in Example Requests, choose an example request. To run the test, choose Invoke. View the output from the test in Log output. After your Lambda function is published, it's ready to use. For use cases, see Examples of How to Use AWS Lambda. Lambda automatically monitors Lambda functions for you, reporting metrics through Amazon CloudWatch. To monitor and troubleshoot your function, see Troubleshooting and Monitoring AWS Lambda Functions with Amazon CloudWatch.